Food is just as essential as air, we need it to survive. Food can also have the opposite effect, instead of helping you thrive, it can kill you. According to an article in Advances in Nutrition, an international review journal, most deaths in the United States are preventable and related to nutrition. So why is it that Dr. Steven Chen – a family medicine physician and the Medical Director of Alameda Health System’s Hayward Wellness Center–was not required to take any nutrition classes in medical school? If you’re wondering where he studied medicine, that would be Stanford, the number two ranked medical school in the country. This phenomenon of not taking nutrition classes in medical school is not a Stanford faux pas, it’s an American one. In the U.S.A., the traditional medical approach has been to focus on treatment rather than prevention. The expression “you are what you eat” has been around for a long time, but it’s seemed to have lost its luster. Fortunately for AHS patients, Chen had a fellowship with Dr. Andrew Weil whose goal is to transform healthcare through an approach called Integrative Medicine. Integrative Medicine is a healing-oriented medicine that takes into account the whole person including all aspects of their lifestyle. Chen, born in the U.S.A., to parents who immigrated from Taiwan, has been with AHS since 2012. He speaks conversational Taiwanese and Mandarin, has spent time working in Taiwan at a Buddhist hospital and has spent time in Paraguay, Guatemala, and Ecuador volunteering and learning Spanish. Through his travels and his training he truly believes that doctors should look at the patient’s total health which includes mind, body, spirit and community. The integrative medicine philosophy recommends using both conventional and alternative methods to facilitate the body’s innate healing response. Integrative medicine asks how or why did the patient get sick, whereas traditional medicine asks what drug can treat the disease. As a way to bring the integrative medicine philosophy to Hayward Wellness, Chen and his colleagues Sweena Burroughs, family nurse practitioner and Zalak Trivedi, registered dietitian, certified diabetes educator, decided to create an innovative intervention focused on helping patients with, or at risk for, diabetes and other serious chronic conditions. The Alameda Health System Foundation secured a grant from Kaiser Permanente’s Greater Southern Alameda Area Community Benefits Program and the Hayward Wellness Center team was able to design and implement Food Is Medicine. Since 2015, Kaiser has provided three grants totaling $100,000 for the program. In order to lay the groundwork for Food is Medicine, Chen used some of the grant funding to bring in a “Chef MD” named Dr. Wendy Kohatsu. Dr. Kohatsu is a doctor who also became a chef through culinary school training. She developed a three session “Food is Medicine” training program designed for busy primary care providers to use food to treat chronic conditions during 20 minute office visits. She worked with Chen and Elibet Jimenez (Hayward’s Group Visit Coordinator) to co-design evidence based nutrition handouts to guide patients on what to eat for common conditions like diabetes, anemia, hypertension, etc. These handouts also served the dual function of reinforcing key messages to the providers. Prior to the training, provider confidence in using food as medicine was 3.8 out of 5. After the training, there was a statistically significant rise in provider confidence to 4.6 out of 5. The second part of Food is Medicine is to offer food prescriptions, also funded by the Kaiser grants. When a patient is seen and they have for example, heart disease, they might be written a prescription for a variety of fresh dark green leafy vegetables like spinach or kale, as part of the Mediterranean diet recommendation. One might think, this is great, but where will patients find these foods? Chen has that part covered too, as he has implemented a food delivery system. Patients can use their food prescription voucher at the “Food Farmacy” that can be found at least twice weekly at the Hayward Wellness Center. 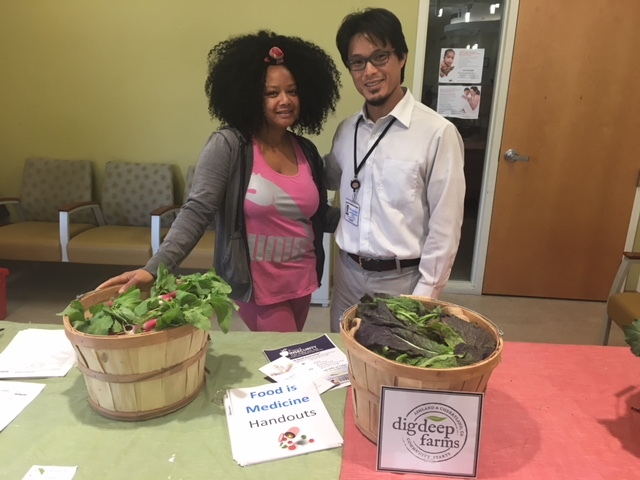 Hayward Wellness has partnered with Dig Deep Farms, a community supported agriculture program in Alameda County, to bring a farmers market to their lobby. This convenient location of the “Food Farmacy” led to patients redeeming 74% of the roughly 1000 food prescriptions that were prescribed. For some, these prescriptions might be for foods they’ve never heard of or cooked before. Part four of the Food is Medicine program, is the “Cooking is Medicine” group medical visits. Staff from the Hayward Wellness Center ( Zalak Trivedi, Sweena Burroughs, medical assistant Beatriz Valencia, and group visit coordinator Elibet Jimenez) host these weekly group medical visits that integrate medical care and with teaching patients of all ages how to cook healthier foods. This picture shows them preparing for one of the family classes where they were going to teach the parents and their children how to make mini cauliflower pizzas. It also included an arts and crafts component to keep the kids busy while the food was baking. For Chen, the Cooking is Medicine group medical visits reinforce the community component that is needed to reduce the social isolation that many patients experience. Getting to know your community and engaging together in healthy activities becomes a win-win for everyone as the patients and providers learn and become resources for each other.